Persistence Market Research in its new research report titled “Ultrasonic Level Sensors Market: Global Industry Analysis (2012-2016) and Forecast (2017-2025)” delivers value in terms of segmental analysis and forecasts on the global ultrasonic level sensors market from a regional level as well as from a global perspective. With the help of extensive research, our analysts have studied how different market dynamics are likely to impact the current and future scenario of the global ultrasonic level sensors market, thus providing useful insights to market players to plan their differentiating strategies capable of evolving with the changing market landscape with a view to achieve competitive advantage in the long run. We have analyzed the key trends, drivers, restraints and opportunities and their magnitudes across various regions in the globe. Impact analysis of key growth drivers and restraints based on the weighted average model is included in the report to better equip clients with the necessary acumen for informed decision making. This report provides historical data of 2012-2016 along with value and volume forecast projections for the period 2017-2025 in terms of revenue (US dollars). The report also includes detailed pricing analysis by type as well as the ultrasonic level sensors value chain analysis. In order to provide a comprehensive overview of the market, we have included detailed competitive analysis and a list of company players with unique selling propositions. The dashboard provides a detailed comparison of manufacturers of ultrasonic level sensors on parameters such as operating margins, unique selling propositions, collective market share, and geographic concentration. The study encompasses market attractiveness analysis of various segments of the global ultrasonic level sensors market. The report presents segment wise forecast of the market along with the overall scenario during the assessment period. The publication focuses on identifying various opportunities in the global market and presents updates and insights associated with the various segments of the global ultrasonic level sensors market. Average prices in US$/unit of ultrasonic level sensors have been considered to arrive at appropriate market size numbers. Key market splits have been deduced from extensive surveys and in-depth primary research. The prices of ultrasonic level sensors have been tracked at the wholesaler level and validated through primary interviews. A number of primary and secondary sources have been consulted during the course of this study. Secondary sources include company websites, company annual reports, white papers, and financial reports. Further deep diving has been carried out by interviewing various market observers and subject matter experts to get an actual picture of the global ultrasonic level sensors market. The data gathered from these sources is validated using the triangulation method in order to gain near 100 percent accuracy. The final data is scrutinized using advanced tools to obtain qualitative and quantitative insights about the industry. 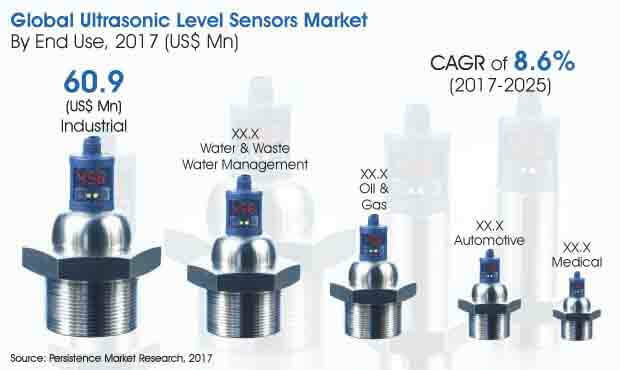 The global ultrasonic level sensors market is projected to represent incremental opportunity of more than US$ 135 Mn between 2017 and 2025 owing to increasing demand in regions such as APAC, North America and Europe. During the period 2016 – 2017, the global ultrasonic level sensors market expanded at a Y-o-Y growth rate of 10.1%. During the forecast period 2017 – 2025 the market is projected to grow at a CAGR of 8.6% owing to tremendous increase in demand from the industrial and water & waste water management sectors. Global demand for ultrasonic level sensors is directly correlated to installation of the product in reservoirs and tanks in food and chemical processing units. With the expansion of manufacturing facilities in this sector, the usage rate of ultrasonic level sensors is expected to witness a manifold increase during the forecast period. The industrial sector is projected to drive high demand for ultrasonic level sensors in the coming years. With the increasing demand for consumable goods such as food materials, drinks, chemicals, and cement there is a huge scope for the industrial sector to grow rapidly. The industrial end use segment is estimated to grow at a CAGR of 10.2% and is expected to hold more than 44% of the global market share in 2025. Along with the industrial segment, water & waste water management and oil & gas segments also show good scope and are expected to expand at significant CAGRs during the study period. In 2016, the organized sector of the ultrasonic level sensors market accounted for nearly 30% of the global market share. Companies that come under the organized sector have strong sound operations and sales infrastructure across key regions with a few of them having a worldwide presence. The key strategy of these companies lies in the expansion of their manufacturing facilities and launch of new products to strengthen their portfolio. These companies also strategize to acquire regional enterprises in domestic as well as overseas territories. Efficient sensors are always necessary and are of utmost importance in manufacturing industries. Food & beverages, cement, chemical and pulp and paper industries are some of the important manufacturing industries where sensors have been used for the last several years. However, there are a few alternatives for these sensors that perform better at lower initial and operating costs. This factor is expected to act as a major restraint for the global ultrasonic level sensors market in the long run. Ultrasonic level sensors are mostly used for measuring the levels of various raw materials and end products in factories that develop chemicals, cement and other liquid or pseudo-solid materials. In some regions such as Europe, the market is saturated in terms of further industrial development. This slowdown in the market has led to less demand for ultrasonic level sensors as there is less scope for opening up of new cement or chemical plants.